In Irish mythology, a banshee is thought to be a female spirit or ghostly figure who foretells death within a household. You may have heard the phrase, ‘howling like a banshee”. She is considered a messenger from the otherworld that begins to scream or wail when someone is about to die. Needless to say, you wouldn’t want to hear that scream. It is supposed to be an unmistakable wail that will send chills up your spine and make your blood curdle. Some cultures say her scream is so piercing it can shatter glass. 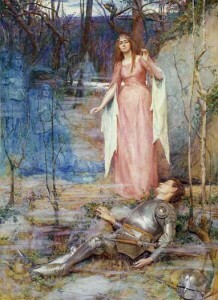 Although the Irish fear the wail of the banshee, it is also considered an honor if she wails at the time of your death. If a group of banshees wail, it is thought that someone of great prominence or holiness is about to die. The creature is referred to in Scottish mythology as a bean sith. She is seen to be washing the armor or clothing of soldiers in battle before they meet their death. Not a sight any soldier on the battlefield would care to lay their eyes on, to say the least. The banshee exists in American folklore and history as well. In the late 18th century, the most prevalent stories came from North Carolina. In this part of the U.S., the banshee was considered a ghoul rather than a harbinger to death. In the South Dakota Badlands, the banshee is thought to wail on a hill somewhere close to Watchdog Butte. The banshees in American are not seen as representing someones inevitable death like it does in the UK. While most consider banshees to be beautiful women with long, flowing hair, some consider them to be ugly, repulsive hags. To summarize, banshees vary as much as the culture or person telling the stories about them. Either way, they are fascinating creatures! Thank you for providing this info regarding banshees. I have looked everywhere and was never able to come up with a correct explanation. Thank you for providing the answer, it is greatle appreciated. Glad I could be of some help, Nancy! Now you know the answer should someone ask. I always wondered what a screaming banshee was. You have given me the answer! I wish a lot more people would publish blog posts such as these which are truly enjoyable to read. Because of all of the fluff floating around on the web, it’s cool to find a blog with excellent content for a change. I always used to hear that saying as well. So happy I could shed some light on it for you!